Rip: Come on, Schrö…don’t let me get away with this! Schrödinger: I can’t do this! Rip: Uh…this isn’t about the game, is it. What you’re saying is that “Jewish identity” can be defined in a number of different ways. Although nobody agrees on which of these ways are valid. Which is why there are people who identify as culturally but not religiously Jewish. I bet it goes the other way, too. Are there people who hold Jewish religious beliefs but face controversy because they’re culturally different? Erin: Oh, you bet. One of the big stories in here is about a woman who converted in order to marry a Jewish man. She couldn’t catch a break either. Integra: These controversies couldn’t start back when anti-Semitism was legally enforced. In the face of segregation, Jewish identity was rock-solid. Now, obviously, anti-Semitism is still a force in the world. It hasn’t been that long since these guys, after all. But the situation is improving all the time — and it’s in this atmosphere that conflict between Jewish groups is getting worse. All the fights in that book are in the United States, in which religious freedom is legally enforced. A few short decades ago, a Jewish state was established — and that’s only led to a fresh round of arguments! It’s as if the Jewish identity itself needs anti-Semitism to keep itself from fracturing! …no. Oh, no, that isn’t it at all. 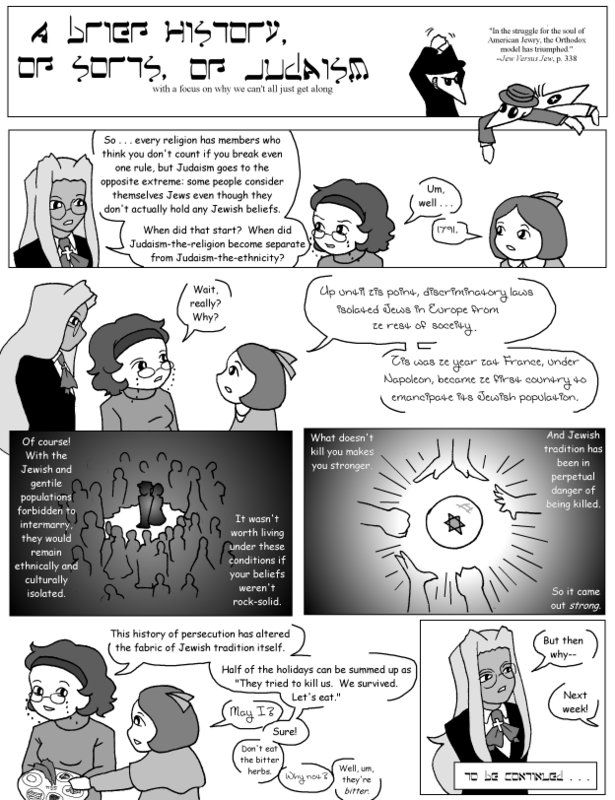 Integra: You have a theory? Erin: I have a thesis. Rip: Woohoo! A winner is me! That’s Tanya on the left and Stephen on the right. Fan 1: Schrödinger is an amazing and unique character. He’s absolutely adorable with that attitude and those ears! I’d pet them forever~. Fan 1: He doesn’t have the attitude? What’s the point, then? Fan 2: So? He’s still cute! Rip: I’m not telling you again, Schrö! Turn it down! Rip: Or I’ll come over there and make you! Schrödinger: I can hit a girl now, you know! Rip: Nothing ever stopped you before! Integra: So…every religion has members who think you don’t count if you break even one rule, but Judaism goes to the opposite extreme: some people consider themselves Jews even though they don’t actually hold any Jewish beliefs. When did that start? When did Judaism-the-religion become separate from Judaism-the-ethnicity? 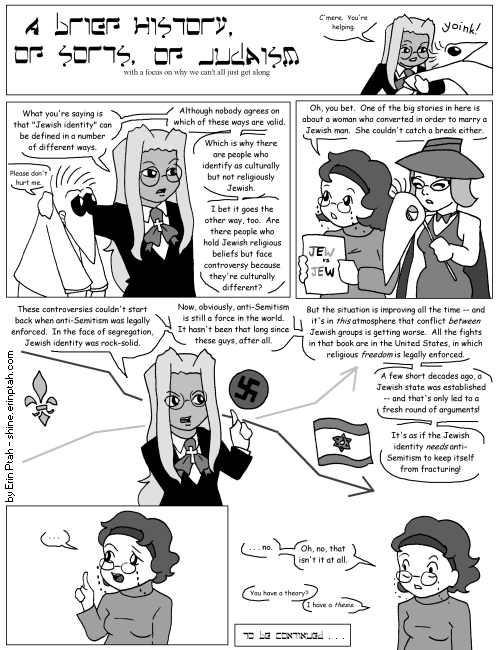 Madeline: Up until zis point, discriminatory laws isolated Jews in Europe from ze rest of society. Zis was ze year zat France, under Napoleon, became ze first country to emancipate its Jewish population. Of course! With the Jewish and gentile populations forbidden to intermarry, they would remain ethnically and culturally isolated. It wasn’t worth living under these conditions if your beliefs weren’t rock-solid. What doesn’t kill you makes you stronger. And Jewish tradition has been in perpetual tradition of being killed. So it came out strong. Erin: Sure! Don’t eat the bitter herbs. Erin: Well, um, they’re bitter. …then where could he be? RIp: Hey! Schrö! Turn that down! Fan 1: What do you mean? Fan 2: Just what I said! Schrödinger has an awesome evil streak. He disrespects his leader. He’s snarky and smart. This looks like Schrödinger, but his personality is completely different! He’s still cute, but that’s it!